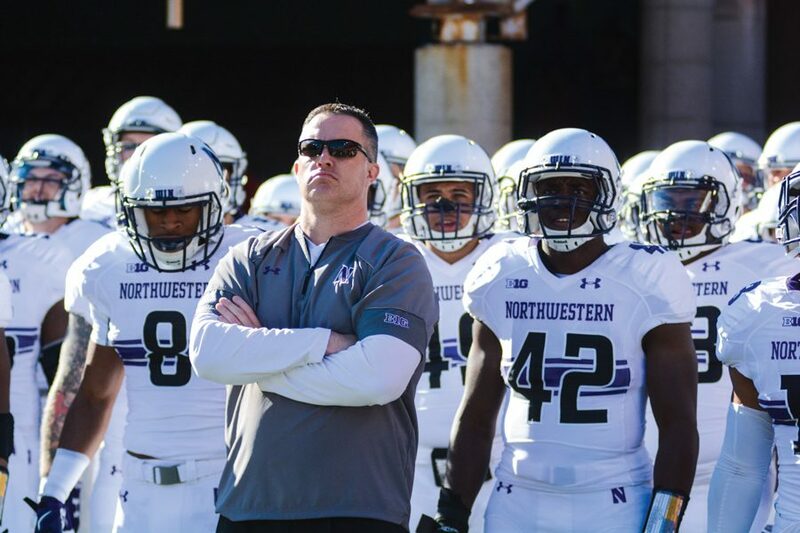 Pat Fitzgerald stands with the football team before a game. Coming off a 10-3 season that featured an eight-game winning streak to end the season, Northwestern faces with an uncertain future as it heads into 2018. Coming off a 10-3 season that featured an eight-game winning streak to end the season, Northwestern faces with an uncertain future as it heads into 2018. Senior quarterback Clayton Thorson’s progress from his ACL surgery is the big storyline, but the Wildcats also lost the leading rusher in program history in Justin Jackson and four-year starting safety Godwin Igwebuike to graduation. The questions will be asked by a brutal schedule featuring four potential games against top-10 teams. Three of those teams come to Ryan Field, as part of a rigorous seven-game home slate. That also leaves five road games for NU, at least four of which should be a challenge in their own right. Before last year, Purdue had been a pretty hapless program. Then, they hired Jeff Brohm to be their head coach and won seven games, including one in a bowl game. They return most of their offense, which should improve even further with more time in Brohm’s system. The defense, however, may regress due to graduation after a surprisingly strong 2017 season. Thorson is the big question mark for Northwestern. If he returns from the ACL tear he suffered in the Music City Bowl, the Wildcats could take advantage of a young Purdue defense. If he’s still on the sidelines, NU may struggle to generate anything offensively. Duke-NU games have been anything but predictable for the past three years. First, there was the bleeding eyesore of a game in 2015, where Thorson went 9-for-23 for 70 yards and two interceptions and was the winning quarterback. In 2016, the Cats lost back-to-back games to Western Michigan and Illinois State but came back with an impressive performance to finish off the Blue Devils. And in 2017, with most people expecting a relatively even affair, Duke ran NU off the field behind quarterback Daniel Jones’s 413 yards from scrimmage. With Jones back and Thorson’s status uncertain for this year’s week two clash, no result is really off the table. Akron was surprisingly solid in 2017, but that’s not likely to continue this year. Last year’s squad was largely lucky to get to seven wins. Teams tend to regress a year after their luckier seasons, largely because, usually, winning a bunch of one-possession games is not a repeatable skill. Akron’s defense struggled, though it could stand to improve a bit in 2018. The offense was bad, and stands to actually get worse after losing most of its skill-position players. This is a game that NU will be expecting to win — by a large margin. Michigan is going to be really good in 2018. The Wolverines last year had a young, talented defense stacked with five-star recruits and possibly the best defensive coordinator in the country in Don Brown. Now, most of that defense is back, except it’s a year older. Last season’s Michigan squad was missing a true star quarterback. Now, they have five-star Ole Miss transfer Shea Patterson. And for all his antics, coach Jim Harbaugh is still a pretty good football coach. The Wolverines will likely be one of the best teams in the country in 2018, and it will take a lot for the Cats to win this one. After the chaos of last year’s dramatic triple-overtime win, it’s easy to forget that Michigan State was actually pretty good in 2017. This year, they return more production on offense and defense than any other team in the country. And NU has to travel to East Lansing this year. Quarterback Brian Lewerke is solid, and he’s got loads of talent around him. The defense last year was among the nation’s best and returns a plethora of young contributors. Some of the nation’s best offenses may struggle to score against the Spartans. NU will likely not be among the nation’s best offenses in 2018. Nebraska is a historically good program. However, very little of that historical success has come since the mid-1990s. Under first-year coach Scott Frost, Nebraska is looking at a rebuilding year in 2018. The Cornhuskers will have new a quarterback and a defense largely bereft of proven playmakers. They’re coming off a largely inconsequential season, and if the Wildcats hope to compete for a Big Ten West title, this game is a must-win. Rutgers is not a standout football program. The Scarlet Knights have won six games the past two years combined. However, the conference’s New Jersey-based team is improving, and its defense is nothing to sneeze at this year. Unfortunately for Rutgers, the offense has not taken similar strides. While the Scarlet Knights have been able to run the ball competently over the past two years, passing has been a serious recurring problem. Against an NU defense that was lockdown against the run last year and returns all its major run-stopping contributors, Rutgers might be looking at a single-digit scoring output. The road to the Big Ten West goes through Wisconsin. The Cats have proven to be a thorn in the Badgers’ side in recent seasons, but the talent gap here is undeniable. Wisconsin just went 13-1 and came close to winning the Big Ten Championship, and there are few major contributors from the 2014 and 2015 Wisconsin-beating teams left on the Cats’ roster. Running back Jonathan Taylor is one of the best running backs in the country, quarterback Alex Hornibrook is at least competent and the defense is as dominant as ever. The 2014 Notre Dame-Northwestern game has gone down as a keystone accomplishment of the Pat Fitzgerald era. If the Cats can win this year’s contest, it will likely be even more impressive. Notre Dame had one of the top defenses in the country last year and returns more defensive production than any other team. If NU hopes to keep this game competitive, it will need to shut down the Fighting Irish’s run game, which was consistently dominant in 2017. Run defense does project as a strong point in the Cats defense in 2018. The Cats had lost 48-7 and 40-10 in two of their last four meetings with Iowa before pulling off an impressive win in 2016 and eeking out an overtime win in a defensive battle in 2017. This year, the Hawkeyes will hold down Kinnick Stadium wielding a recently overhauled offense with a second-year offensive coordinator, a relatively new quarterbacks coach and an unproven quarterback. Iowa’s defense looks nearly flawless, however, and Thorson and Jeremy Larkin will need to be on top of their games in this crucial intra-division battle. Second-year coach P.J. Fleck has his work cut out for him with this squad. Last year, starting quarterback Demry Croft completed more passes to NU than to Minnesota before being replaced and the Cats cruised to a blowout victory. Croft is gone, but Fleck is still building around a young team, featuring a freshman quarterback and multiple unknowns on defense. By this game, however, it’s quite possible the Golden Gophers will have figured things out and shut down the Cats’ offense like they did in 2016’s most forgettable game for NU. The Fighting Illini are the second-worst team on the schedule, ahead of only Akron (and debatably behind them). Lovie Smith is likely in his last year as Illinois’s head coach, and it’s quite possible he is fired before this game even happens. Illinois struggles offensively and defensively, particularly with run defense, a significant area of concern given NU’s run-dependent tendencies. The Fighting Illini are one of two games on this schedule that should be treated as an automatic win. The bonus: it counts as a conference win.